We have been exploring the zoo a lot this summer. At home, we've been doing fun zoo activities for preschool time. One activity that the boys have asked for over and over again, is zoo cookies. These are a fun and easy zoo themed snack to make. They are great to eat while you read a book about the zoo. We made these cookies after reading Dear Zoo by Rod Campbell. You can read a review of Dear Zoo here. 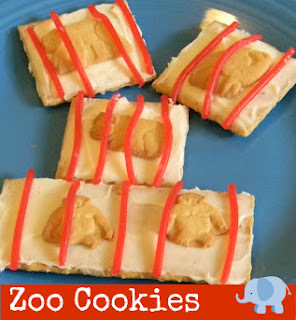 These zoo cookies were super easy to make. The boys could fully participate in the activity, and they tasted pretty good too! 1. Ice the graham cracker with white icing. 3. cover with red licorice pieces running vertical to make a "bars"
I submitted the recipe for these cookies to the We Teach Summer Learning eBook. This is a 54 page ebook with summer fun activities for crafts, literacy, math, science, and play. This ebook is completely free to all members of the we teach network. The good news is, the we teach network is also completely FREE! Also, this year there are links to free printables in the ebook. Would you like more ideas for summer learning? Check out my summer playtime pinterest board. I'd love if you'd follow while you are there. I love the animal cracker cages, I will be adding to our lunches on our next Zoo Field Trip, thanks so much for sharing!! Have a wonderful week! Those cookies look like fun! Thanks for sharing with Hey Mom, Look What I Did at Adventures In Mommy Land!! !